The Amy Gillett Foundation announced on Monday that Dr. Kimberely Wells has been selected as the recipient of the 10th Amy Gillett Cycling Scholarship. The scholarship provides Wells with the opportunity to race for the High5 Australian Women’s Road Development Team in Europe. The selection panel reportedly chose Wells as the scholarship recipient because of her cycling achievements and her demonstrated qualities as a role model in both the medical field and her community work. Wells will serve as an ambassador for the Amy Gillett Foundation and work to raise awareness of the Foundation’s mission of reducing the incidence of death and injury of cyclists by promoting safe cycling for all road users. Wells calls the mission close to her heart. 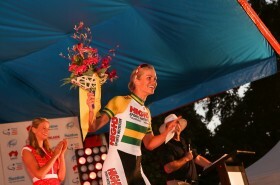 The current Australian national criterium champion was celebrating her 20th birthday on July 18, 2005 when she learned of Amy’s death in Germany. A second year medical student at James Cook University, Wells we completing a placement in a remote Indigenous community in the Northern Territory. The Amy Gillett scholarship is awarded annually on fulfillment criteria that includes cycling achievements and future potential, work and study experience, aspirations, personal and team qualities, and other sporting background.